People nowadays have become more aware of interiors. They pay close attention to the minute detailing of the house in order to render it unique and elegant. The architecture is selected minutely, the intricacies are taken care of then the interior items are selected in a way that it matches the overall essence of the room. The architecture plays a key role in determining the quality of the house. Most of the people only focus on the “bigger details” of the room for example, the width, length, flooring, installing window frames and so on. However, a very few focus on the corner and cornices of the room. The corners and cornices are often neglected as these are considered unworthy. How to choose a nail gun for crown molding? However, the overall finishing or look of the room is determined by how beautiful the corners are installed or crafted. An intricate and well-crafted corner grabs attention instantly and provides finesse unlike a mundane corner which can even turn the room rather odd. Many of the eminent architects now-a-days suggest on installing a crown molding. Crown molding is often confused with molding which are both far distinct from each other. Molding is a general term for any type of trimming in the house or a room while crown molding is a specific term for molding a ceiling particularly the place where the walls and ceilings intersect. The intersection is often left mundane in most of the houses. But if you observe the places with elegant architecture then you will notice crown molding in each of them. Crown molding is one of the main reasons in beautifying a place or a room. It trims the shape of the intersection. Crown moldings are not limited to the intersection of wall and ceiling but these are also installed on the corners of doors or windows to give a “royal” touch to the house. Earlier, these were installed only to fill the gaps between the intersections but with advancing age it became a part of the decoration. The moldings are typically made up of wood cut intricately in the size of 1-1/2 to 7-1/2 inches. The wooden frames are then installed with the help of a nailer. Rope border and so on. The selection of a proper crown molding is also important. It entirely depends on the length and width of the room as well as the type of interior you are expecting. The most common crown moldings is the distinguished dentils which can be found in most of the houses these days. Before deciding on a specific crown molding research about it properly, consult the architects and interior designers because the overall effect of the room is going to be determined by this minute detailing. Earlier, architects were given the responsibility of installing crown moldings into the houses but with the growing trend for DIY more and more people are inclined towards installing it on their own. So, with this trend apart from the selection of proper crown molding the selection of a suitable nailer gun also becomes important. A good nailer gun decides the fate of the crown molding. A lot of people do not have much knowledge about the nailer guns. These people are likely to fall for cheap and inefficient products. The market is over loaded with a variety of nailers from a wide range of prices that selecting the right one becomes tough. However, you need not to worry about it anymore. 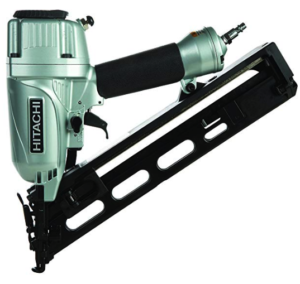 This product from the Hitachi is one of the best nailers for crown molding. It is especially designed for crown and base molding, cabinets, window and door casing as well as staircases. The gauge needle length of 15 renders this device powerful to fix a crown molding. The 34 degree magazine angle allows the user to reach the cornices of the room. The best part about this device is the air duster which keeps the dust away from your face. The light weight makes the device easy to use. Specially designed for crown moulding. The depth of the nailer can be adjusted easily with the help of a drive dial. Available in two versions that is, with 15 gauge needle and 16 gauge needle. Angled magazine makes it easy to install even in tight spaces. It does not come with an oil or lubricant. This is yet other efficient equipment specially designed for crown molding. It is a lightweight device which makes it easy to use. The magnesium housing renders it corrosion free. It is an angled nailer which makes the installation possible even in awkward spaces. The oil free feature renders the device low maintenance and eliminates the risk of oil stains. Adjustable depth guide sets the nails easily and quickly. It can hold up to 130 nails. 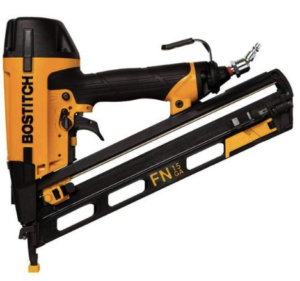 The nails used in the nailer have to be of BOSTITCH. 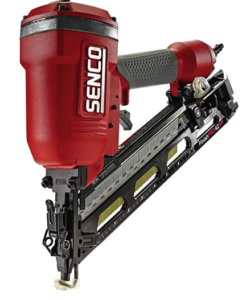 This finish nailer from Senco is a lightweight device which does not feel burden on the hands. The magnesium housing makes it corrosion free and comfortable to use. It is designed with Neverlube technology that is, an oil free device which removes the hassle of lubrication from time to time. The 360 degree angle is suitable for varied uses. EZ clear latch to clear out jams easily. Thumb wheel adjustable drive to adjust depth. It is not an angled nailer. 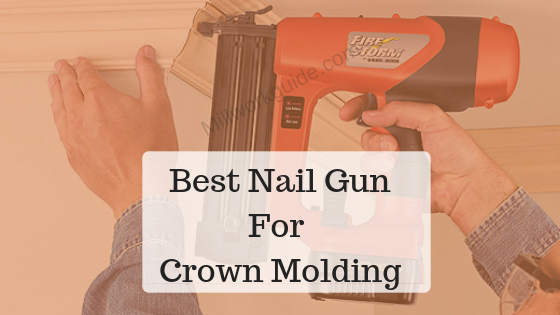 It is one of the best nailers for crown molding available at affordable prices. It is suitable for the crown as well as base molding, cabinets and window casing. The dual trigger mode comes with single and sequential firing. 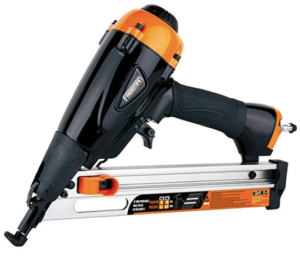 The nailer is constructed with a No-Mar tip which eliminates danger to the working surfaces. The rubber grip of the device makes it easy to hold and use. Tool-less and easy to clear nose for quick nail extraction. 34 degree angle allows the user to reach corners and tight spaces. Jamming is observed by many users. It is quite obvious for you to get confused looking at the various options available in the market. For you to select a proper nailer for crown molding you must first know the three types of nailers which are available in the market. Finish nailer ( shoot 15-16 gauge nails )- it is the strongest nailer and shoots the biggest nails. Excellent choice for crown molding. Brad nailer ( shoot 18 gauge nails )- it is also a strong nailer but weaker than the finish nailers. It can be used for crown molding when a finish nailer is not available. Pin nailer ( shoot 23 gauge nails )- it is the thinnest and weakest of all nailers. Not at all considered for crown molding. First of all determine the size, width and length of the crown molding you are going to install. If your crown molding is on the thicker side then you will need a strong support while installing it. A nailer of needle gauge length 15 or 16 is perfect for the molding. Next thing to consider is the air compressor. You do not want the dust to cover your face while working and so an air compressor is a necessity. Unless you have someone to help or an air compressor look for a nailer gun with air compressor. Next big thing is the angle of the nail gun. The nailers are either straight or angled. An angled nail gun is suitable for tight spaces. A good nailer gun decides the fate of the crown molding. A lot of people do not have much knowledge about the nailer guns. These people are likely to fall for cheap and inefficient products. The market is over loaded with a variety of nailers from a wide range of prices that selecting the right one becomes tough.